Develop a child's imagination and love of storytelling while helping them write and illustrate their very own books. My Awesome Book comes with everything kids need to develop their own characters, plots, and settings. The finished product can either be mailed to you or completed online. Ages 6 and up. Coloring with CLAY is a fun new way to spark creativity and nurture confidence, all while engaging in sensory play and developing fine motor skills . The kit comes with 4 thick coloring sheets, 12 clay sticks and 3 sculpting tools. Ages 5 and up. Hey Clay Animals come with 18 cans of modeling clay and an interactive APP that teaches kids how to form different parts to create the animals. Hey Clay is great for building fine motor skills, inspiring imaginations, following directions, and more. Ages 3 and up. My Comic Book includes everything a child needs to write and illustrate their own 18 page professionally printed comic books. Ages 6 and up. This Portable Art Kit can be used as an easel or a lap desk. It includes Beeswax crayons, colored pencils, chalk, a dry erase marker, sharpener, sponge, and a sketch pad. This craft set comes with over 100 craft components to inspire open-ended play and creativity. It includes: air-dry clay, google eyes, feathers, pipe cleaners, felt, pom poms, ice cream sticks, scissors and more! Ages 4 and up. This book really does have amazing crafts! With easy to follow directions, kids get to practice cutting, folding, and pasting to create original 3D paper toys. Wooden Robot Kit comes with 3 robots, 3 sticker sheets, 12 paints, and 2 brushes. Painting and decorating the robot promotes coordination, creativity, and attention. How To Draw is a wonderful instructional book that breaks down and simplifies how to draw different animals, making it easy for kids to learn to draw even the more complicated pictures. My Hand Art comes with 20 creative projects ideas for kids to make out of their hands. It includes pom poms, googly eyes, glue, and crayons. 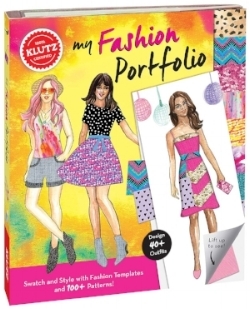 If your kids are into fashion they'll love My Fashion Portfolio. It comes with over 40 unique looks for them to design and style on their own. Ages 7 and up. Colorfoldz are my new favorite stencils/coloring books. All you have to do is fold over 1 flap at a time and trace. By the time you're done with all the flaps, you won't believe what you've created. Colorfoldz comes in a variety of pictures and flap amounts to fit younger and older kids. 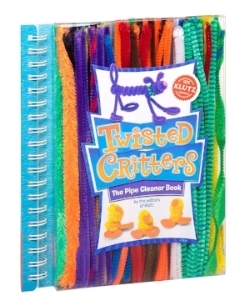 Twisted Critters comes with over 72 pipe cleaners and an instruction manual with step by step instructions to create cute little fuzzy creatures. Ages 8 and up.